Thanks to reader C.S. for the tip! An alternative that's been available for a while is to subscribe to the magazine with airline miles. A 1-year subscription for 900 United miles is an outstanding redemption rate. Other carriers offer similar deals as well. This is a good one! Legal Harborside is hosting a Cakebread wine dinner and Dennis Cakebread will be on hand to share the Cakebread story and describe the wines. Long time WWP readers will recall that Cakebread is the wine that got me into wine. For more information on what makes the Cakebread brand special check out this in depth trip report. Cakebread is a great place to visit. I'd recommend springing for something more than a quick tasting to get a feel for what they do. 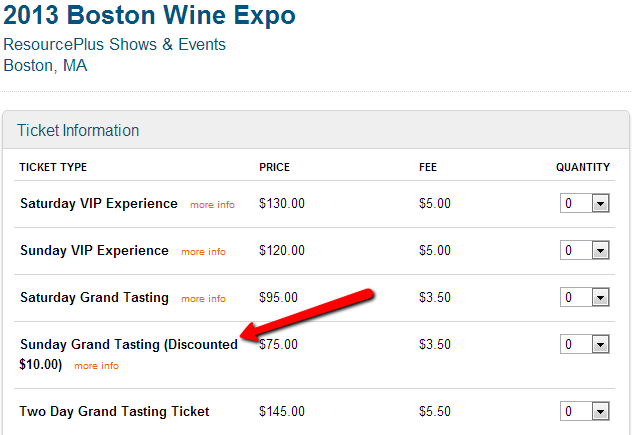 HOW: Reservations can be made by contacting 617.530.9470 or visiting www.legalseafoods.com. WHAT: On March 11th, Legal Harborside will team up with Cakebread Cellars’ Director of Sales, Dennis Cakebread, to host a wine dinner at Legal Harborside. This four-plus-course culinary adventure will highlight the best tastes from sea and vine. Cakebread Cellars has vineyard properties located throughout Napa Valley surrounding the production facility in Rutherford where it all began in 1972. Today, the winery owns 13 sites totaling 982 acres. Wine.com is our nation's largest online wine retailer. They're the only national retailer I'm aware of that's gone through the trouble of obtaining a Massaschusetts retailer license so they can legally ship wine to residents here. They've gone to similar lengths in other states and as a result have the widest reach of any online wine retailer. But their prices are high. And they're not exactly the most favored of wine retailers thanks to antics like a sting operation targeted at other wine retailers who ship illegally. So as consumers we interact with them in a "special" way. We'll buy from them if there's a good deal to be had, but we don't exactly "like" them. One of the central problems, from a consumer's perspective, is how expensive shipping is. This is true for wine in general but Wine.com seems to be pricier than most. So this post will serve as a description of a way to get their fully loaded prices down out of the stratosphere with their Steward Ship program combined with a little trickery called The Double Dip. Here's how to do it, step by step. Bonus: When I ordered the gift card I was emailed a code for $10 off my next order of $75 or more. There are tons of different cashback portals out there. Some of my favorites lately are Ebates and Fat Wallet, not to mention shopping portals associated with credit cards. There are even sites which try to dynamically compare cashback amounts across the various portals. Try CashbackHolic.com and CashbackMonitor.com. Once my gift card arrived (Wine.com chose to mail a physical gift card out) I went back to Wine.com to redeem it through a different online portal. I chose SavingsWatch this time because it offered the largest percentage at the time - 7.5%. I loaded up my shopping card with $75 worth of wine, applied the $10 off $75 coupon I received when buying the gift card, used my Steward Ship benefit that's tied to my account for the year, and applied the $25 gift card. The remaining balance went on my credit card. I was able to find a few wines at good prices I was genuinely enthusiastic about purchasing. 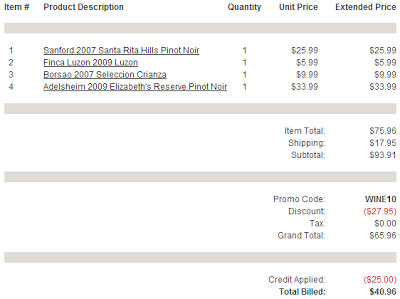 Pro tip: Try sorting on Wine.com by savings - one time I found a wine being sold for less than $2 on sale. Not that I was enthusiastic about trying that wine but it was pretty amazing they'd conceivably ship it out for less than $2 fully loaded. A few days later the transaction appeared in my SavingsWatch.com acount. Notice in the image below how each of the 4 bottles I ordered were credited for cashback. The $10 coupon was charged back against that, but the free shipping didn't come into play (nicely) and most importantly the amount I paid for with the gift card didn't negate the cashback. A successful double dip! Ironically, two things went wrong while performing this experience I didn't expect. First, uPromise still hasn't credited me 5% of the $25 gift card purchase although their terms explicitly say gift cards qualify. I called them about the missing transaction and they said it can take up to 40 days to process. I'm not so much concerned about the $1.25 of course, but it's annoying chasing these things down. Some portals are better than others. uPromise has frequently failed to credit me for transactions. Second, my order actually still hasn't arrived. Wine.com has reliably fulfilled orders for me in the past, and this one has been mostly FedEx's fault, but after missing a couple of delivery attempts and requesting it be routed to a nearby FedEx location the order seemed to go into no man's land. It illuminates one of many ways this is not the most efficient way to get a few bottles of wine delivered. uPromise hasn't paid the 5% back yet, but I think they will if I submit a missing transaction after 40 days have elapsed. 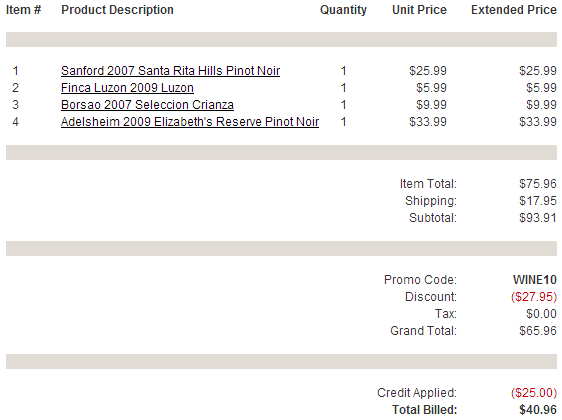 Plus the wines I chose were on sale and priced pretty well. The Sanford Pinot Noir sells in the $30s at most online retailers in the country. That's like paying $19.23 fully loaded for that $25.99 bottle of Sanford that sells for $35 and up in most stores. Plus no tax on wine in Massachusetts. And that doesn't include the cashback/points/miles/signup bonuses you might be getting on your favorite credit card. If you consider that you might call this a triple dip. The Steward Ship benefit has cost me $25 or $35 per year over the last few years. I typically use it 6-12 times a year. What's nice about it is that you can ship out a single bottle if you like. For example, when the 2010 Cosme Gigondas got 95 points from Spectator I ordered a single bottle and it showed up a couple days later. Subscribe to The Wellesley Wine Press and I'll mention next time I see Steward Ship on sale. 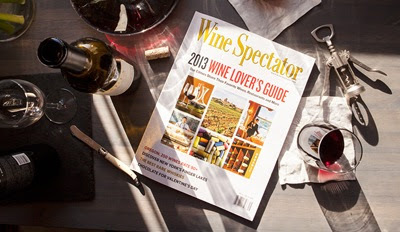 Sometimes Steward Ship also includes a Wine Spectator subscription extension. The actual amounts you could potentially save using this technique will vary over time, and it's a rather complicated transaction. But I thought it was an interesting exercise that might provide a way to help get more value out of their Steward Ship program. 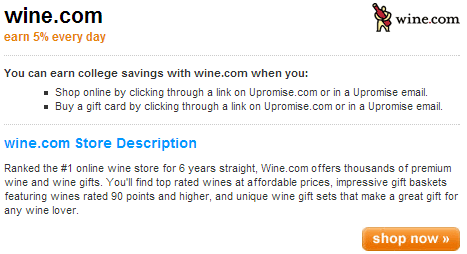 Question of the Day: Any other tips and tricks for getting the best deals from Wine.com? A couple weeks ago we ran a poll to see which of 10 applicants we'd prefer be granted liquors licenses on newly-wet Needham. The town had up to 6 licenses to dole out, but no obligation to let them loose all at once. This will be the fourth store under the same umbrella which includes Upper Falls, Post Road, and Auburndale. Nice stuff presented in a bare bones layout with rotating regions categorical discounts. You'll see Sea Smoke and similar baller wines offered here occasionally. Similar to Wilson Farms in Lexington and recently ambitiously expanded. Looking forward to seeing a wine shop, garden center, and grocery rolled into one! I hear the owner here is the same as Ball Square in Somerville. Boutique retailer with locations in Newton and Brookline. Heavy slant towards wines highly rated by prominent publications. Nice aesthetics and well run. Full review. Everyone loves Bin Ends for their affordable exciting wines. This will be their second location, their first being in Braintree. My favorite part? Their bargain bin. Can't wait to see them closer to Wellesley. Noticeably excluded? Gordon's and Blanchards. And I would love to see Craft Liquors given a node thanks to their swanky renderings. Who knows maybe we'll see their first location appear in Wellesley? Congratulations to the new licensees! I'm looking forward to seeing what they offer to wine enthusiasts in the area. 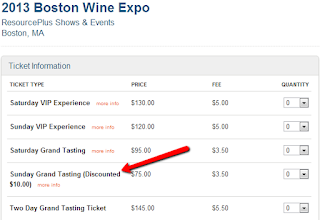 The 2013 Boston Wine Expo is coming up February 16-17 2013.